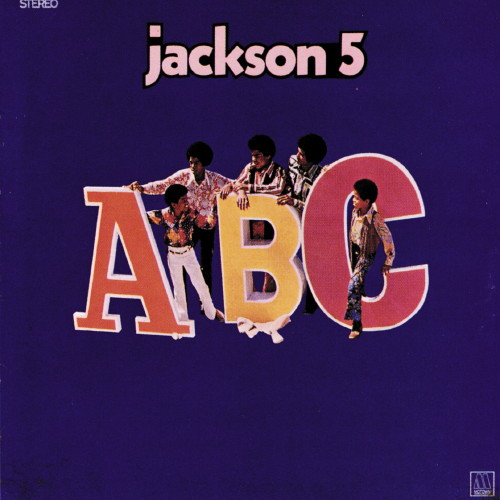 E – is for education, another area the Rams excelled. VCU student-athletes posted a 3.02 GPA during the Fall 2012 Semester, the highest in school history. Derek Zoolander can go build his Center For Kids Who Can’t Read Good somewhere else. We’re good. F – is for Fantastic Freshmen for the Fortuitous Future of VCU Athletics, although Fantastic Freshmen is also acceptable. There were many for VCU in 2012-13, including (but not limited to) men’s soccer’s Devon Fisher and Dennis Castillo, men’s basketball’s Melvin Johnson, women’s hoops’ Jessica Pellechio, men’s tennis’ Michael Voscek, women’s tennis’ Yukako Noi, golf’s Adam Ball and Steffen Harm, and many others. G – is for goal scoring, the specialty of field hockey’s Kelsey Scherrer, who became VCU’s all-time leader in 2012. Scherrer, who led the Rams with 16 goals last season, broke Alycia Yoder’s 18-year-old mark of 38 career goals and finished her outstanding career with 53. Kelsey Scherrer scores her record-breaking goal Sept. 2. H – is for Hits, as in Joey Hits, the nickname I created five seconds ago for VCU hit machine and third baseman Joey Cujas for the sole purpose of this article. But Cujas’ hitting is no joke. In three seasons with the Rams, the Midlothian native hasn’t hit worse than .321. This year, he batted .333 and piled 72 more hits onto his career total of 226. Cujas has a shot, albeit a challenging one, of catching VCU all-time hits leader Eric Suave (317) next year. I – is for in the polls, where three VCU programs appeared this year. The men’s basketball team returned to the polls for the first time in the regular season since 1985. VCU was ranked as high as 19th in the Associated Press and 16th in the Coaches Poll during the season. The Rams were ranked 23rd in the final Coaches Poll of the year. The VCU Men’s Soccer team climbed as high as 19th in 2012 and were ranked 25th by the NSCAA at the end of the season. Meanwhile, the Men’s Tennis squad also cracked the top 25 during the regular season and finished 2013 just outside that threshold. J – is for Jason Johnson, who was selected 13th overall by the Houston Dynamo in the 2012 Major League Soccer SuperDraft. A speedy forward, Johnson scored 28 goals in three seasons with the Rams, and helped return the program to national prominence. With 1,000 wins, you’d smile too. Paul Kostin grins on the way to the record books. K – is for Kostin, Paul. 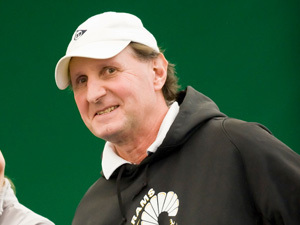 The longtime VCU tennis coach won his 1,000th match this season. He is one of just four Division I coaches to reach that milestone. At 59, he shows no signs of slowing down anytime soon. L – is for left-handers, southpaws, portsiders. You get the idea. The VCU baseball team was chock full of more left-handed talent than the National Association of Left-Handed Golfers. Heath Dwyer (7-6, 2.78 ERA), Ryan Farrar (4-6, 4.36 ERA) and Matt Lees (2-6, 1.22 ERA, 11 saves) helped comprise a VCU pitching staff that posted a 3.87 ERA this spring. M – is for Marlene Stollings, who recently completed her first season leading the women’s basketball program. Long considered an excellent recruiter, Stollings has already assembled a head-turning class for 2013-14. The Rams’ six-player class has been ranked tops in the A-10 and in the top 40 nationally, and that was before the addition of Auburn transfer Chadarryl Clay. N – is for NCAA Championships, visited this year by men’s basketball (third round), men’s and women’s tennis (first round), men’s soccer (second round), two women’s track and field athletes (Kiara Porter and Jaleesa Williams) and two VCU tennis players (Max Wennakoski and Cindy Chala). O – is for the Olympics, which featured a pair of former Rams last summer in London. Professionally tall person Quanitra Hollingsworth has made a habit of being the first VCU Women’s Basketball player to do a just about everything and competed for Turkey, leading that country to the quarterfinal round. Meanwhile, Hayley Moorwood played for her native New Zealand in the women’s soccer (or footie or whatever they call it across the pond) competition for the second time in the Olympics, and helped the Ferns (their term, not mine) reach the elimination round. P – is for (Jessica) Pellechio and (Robyn) Parks, who provided punch in Marlene Stollings’ first season as coach of the VCU Women’s Basketball program. Pellechio set a school record for 3-pointers in a single game and averaged 11.3 points last season, while Parks averaged 18.7 points and 7.9 rebounds per game. I floated the nickname P&P Basketball Factory (and ode to 90s act C&C Music Factory, for you young folks), but it didn’t pick up traction. But Pellechio is a rising sophomore and Parks will be a senior, so we have another opportunity to hitch our wagons by my whims next winter. 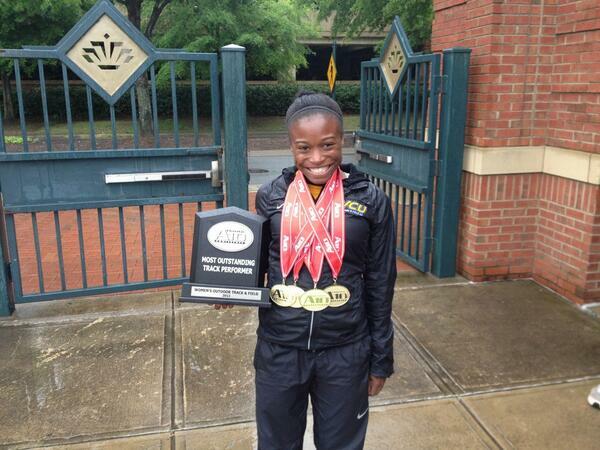 Kiara Porter poses after apparently winning the contents of Fort Knox at the A-10 Championships. Q – For Quarter Porter or Miss Quarter Porter or Queen of the Quarter Mile. Either way, we’ve met our ‘Q’ quotient today. Of course, we’re talking about Kiara Porter, who put together one of the best seasons by any Ram, in any sport, in the last decade. Just a sophomore, Porter, a 5-foot bolt of lightning, placed 17th nationally in the 400-meter run, won four gold medals at the Atlantic 10 Championships and laid waste to VCU’s record books. At the NCAA East Regional, Porter ran 52.33 in the 400. During her VCU career, she’s lowered the school record in that event by nearly two seconds. R – is for Ruffin, Brandon. A sophomore thrower, Brandon Ruffin won the A-10 weight throw indoors this winter (19.30m), then placed second in the shot put (16.64m) and fifth in the discus (47.54m) at the A-10 Outdoor Championships this spring to lead to Rams to a fifth-place showing. S – is for Samadan, as in Martina Samadan. In 2012, she became the first VCU Volleyball player to earn AVCA All-East Region and All-America Honorable Mention status after a freshman season that saw her set school records for blocks (172) and hitting percentage (.349). T – is for the 709 turnovers forced this year by the VCU Men’s Basketball team, an average of 19.7 per game. The Rams, employing Shaka Smart’s signature “Havoc” full court press, forced 291 more turnovers than they committed in 2012-13. U – is for unscored upon, as the VCU Women’s Soccer team was so often this year. The Rams were so stingy with their opponents you’d think they spent the entire season playing the New York Jets. VCU ranked second in the A-10 and 30th nationally in goals-against-average (0.727) and allowed just 115 shots in 22 matches. During one nine-match stretch this season, the Rams went 7-1-1 and allowed just three goals. VCU finished the season 12-5-5. V – is for victory, which the Rams did often in 2012-13. VCU teams were 170-87-10 this year, a .655 winning percentage that was not only the best among Virginia’s 14 Division I schools, but was also the second best in school history. W – for the Williams sisters, Jessica and Jaleesa, the First Family of VCU Throwing. Jaleesa became the first VCU thrower to achieve All-America status when she placed 12th in the NCAA Championships in the discus and shattered the school mark in that event with a toss of 53.12 meters (174’ 3’’). Jessica, meanwhile, won the A-10 discus title outdoors and placed fourth in the conference in the shot put indoors. Good news, folks, both women are redshirt juniors, and they’ll be throwing heavy stuff for VCU again next season. Although, given their Nik Wallenda-type career progression of achievement, they may have to graduate to throwing smart cars or filing cabinets. You can run. You can hide. But Bri-fense is coming, like it or not. X – as in the Roman numeral ten, which is how many steals sophomore Briante Weber grabbed in VCU’s season-opening win over Florida Gulf Coast (before it became known as Dunk City U.S.A.), a school and Atlantic 10 record. Occasionally, I wonder if FGCU point guard Brett Comer sees monsters under his bed at night, and if he does, if they wear a headband and a No. 2 jersey. Y – is for Yoram Mwila, who would have been a senior on this year’s men’s soccer squad. Mwila died on June 9, 2012 following a car accident in his native Zambia. The men’s soccer team wore Mwila’s No. 9 on its sleeves this season, and Coach Dave Giffard has said the number has been effectively retired in honor of the popular forward. Z – is for zero, the number of unsold seats at VCU Men’s Basketball games this season. With 17 more sellouts in 2012-13, VCU’s sellout streak has reached 35 consecutive games. VCU also won the Naismith Student Section of the Year in 2012-13.